TEHRAN, October 21 (RIA Novosti) - Russia and the Persian Gulf states of Iran and Qatar will hold regular discussions on prospects of cooperation in the natural gas sphere, the chief executive of Russian energy giant Gazprom said on Tuesday. 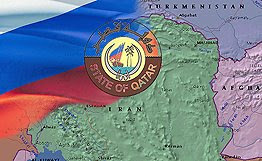 Alexei Miller took part in talks in Tehran on Tuesday with Iranian Oil Minister Gholamhossein Nozari and Qatari Energy and Industry Minister Abdallah bin Hamad al-Atiyah. "At today's meeting, an agreement was signed on establishing a working commission, one goal of which is to study joint and three-party projects," Miller said. Miller said dialogue between Russia and the two largest gas producers in the Mideast could be highly useful for the gas market as a whole, and provide a boost to gas exporting countries. "We are united by the world's largest gas reserves and common strategic interests, and what is especially important, the strong potential of cooperation under three-party projects. All these factors laid the basis for accords of principle importance. We agreed on regular Gas Troika meetings three or four times a year to discuss the most important issues relating to the gas market that are of mutual interest," Miller said.